Last summer I started a poll on Print on Demand - Resources for Artists to identify what people's preferences were in relation to different Print on Demands websites. The popularity of the various 'print on demand' sites waxes and wanes. We know something about the traffic they get ( see the traffic charts below) but what do people think of them after they've used them and/or bought items from them? This poll set out to find out. This is the situation some six months on. 44 people have responded to date. Clearly Zazzle is way out in front. Zazzle's premier position is echoed by the growth in traffic to their website. Zazzle and Cafe Press are far and away the largest competitors with traffic peaking at nearly 7 millon a month in December. However, since last summer, Zazzle has consistently attracted more traffic than Cafe Press. Red Bubble is the newest website in this competitive marketplace. It picked up second place in the order of preferences. Again this is born out by the compete.com chart when comparing the traffic of Imagekind and Red Bubble - where it can be seen that Red Bubble has been beating Imagekine for all of the last 12 months. Interestingly 20% of those voting preferred another site - but rather frustratingly didn't say which! In the print of demand publications stakes, Lulu is preferred to Blurb. Again this reflects the relative position on traffic. Overall, traffic is a pretty good indicator of preference - with the exception of CafePress. This site has extremely high traffic but is not the site of choice for most people. One can only assume this say something about people's experiences with the site or their reputation. What's your preferred print on demand website - and why? 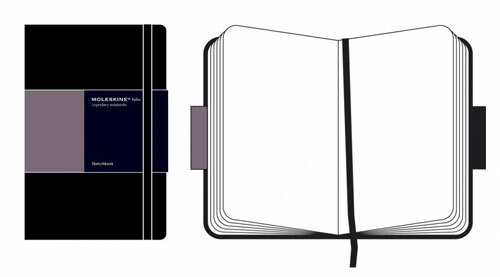 Yesterday I came across an A3 size Moleskine Folio Sketchbook - and bought it without a second thought. 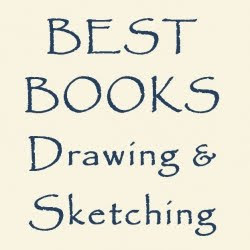 I've been using Moleskine sketchbooks for the last five years and although I might go out with other makes there's always at least one in my backpack! I haven't even got the cellophane cover off yet and I'm ecstatic. the paper is the same high quality heavy paper, acid free paper. The 160 g/m2 weight means nothing ever shows through to the other side - which means you can use both sides of a page all the way though the sketchbook!
. The latter is invaluable for avoiding the edges of your paper getting dog-eared. The big benefit for me of having an A3 size Moleskine sketchbook is that I will now be able to do the same large sketches - but with no crease down the middle as I no longer need to use a double page spread. Now I've got a paper I really like for the media I use and that's big enough for the size of sketch I like to do I might even taken one apart and start selling sketches! 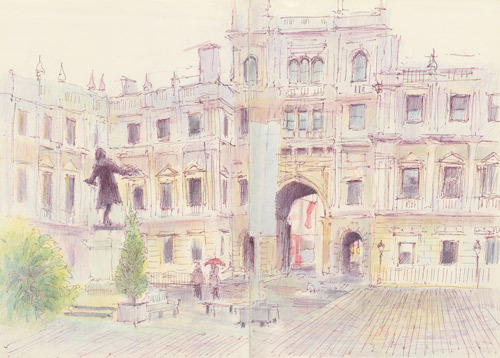 I bought my new A3 sketchbook in the big Waterstones on Piccadilly. It was priced at very nearly £30. However I've seen them for less elsewhere including on Amazon. Which dark soft pastels are the best? Soft pastels in very dark colours present a challenge which some manufacturers have tried to address. This post is about soft pastels in dark colours, shades and tints - and a new opinion poll. Some brands can feel abrasive and scratchy. Dark shades and tints of soft pastels have a reputation for not being the softest of soft pastels. It can also be very difficult to get hold of good rich colour in dark shades. Dark should not mean that colour disappears. 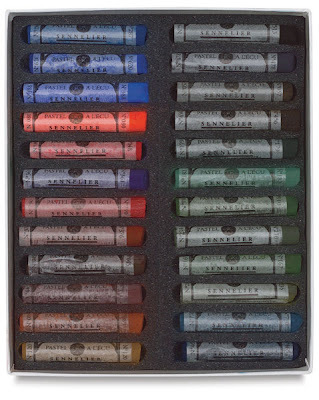 Some manufacturers have addressed these problems by creating specific dark sets of soft pastels. These aim to balance the quality of pigment colour (ie colour not black!) with softness and the effective release of the pigment onto the support while also offering a good range of dark colours. I then got a set of Unison Darks and was smitten. These are very dark and yet have good pigment colour - but are also not abrasive or "too hard". My set of Unison Darks - photographed when still relatively pristine! 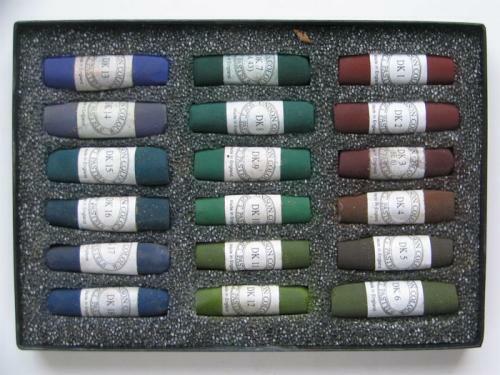 Diane Townsend has a set of 12 dark soft form pastels. she also lists the individual colours whcih means they could be bought singly. 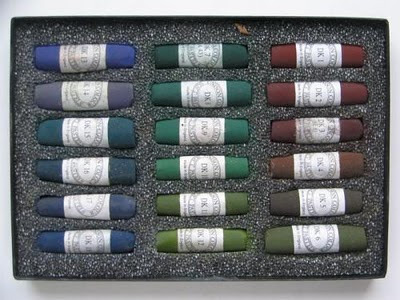 These are Deborah Secor's favourite dark pastels and she says they cover Wallis paper really fast. She recommends the dark green for those doing landscapes. Sennelier have a set of 24 dark tones. Girault are said to have a dark set but I've never seen one and can't find one on their website. Others may have developed specific dark sets and if so I'd love to hear about them. 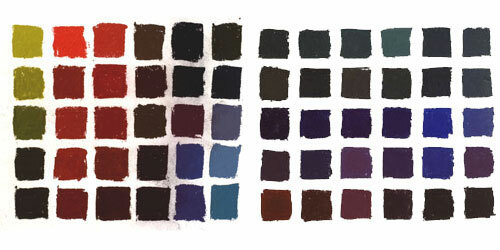 Which dark pastels do you like best - and how do you buy them? I'd also love to hear about your favourite brands of dark pastels either in connection with the poll or by commenting below. ALSO How do you like to buy your dark pastels?